We prefer to think of this as a change, not retirement. 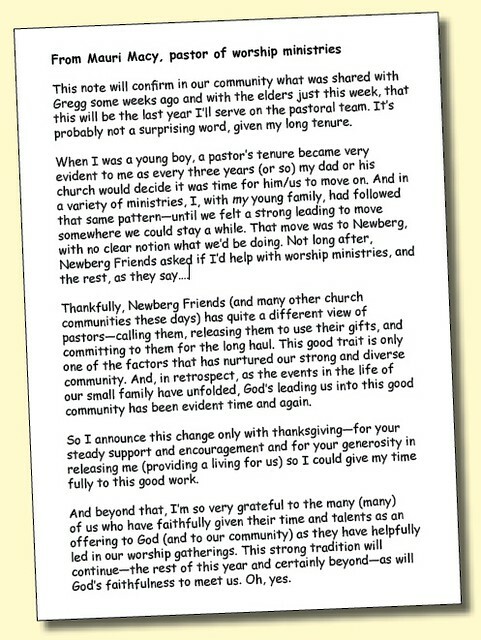 After 33 years on the pastoral team of Newberg Friends Church, the church and he are ready for a change. Mauri is a musician with a lot of music left in him, and after a well-earned breather come June 2014, he is eager to see what next step God presents. It might be concentrated time in his recording studio, putting down some of his “simple changes” hymn arrangements and finding good ways to share them. And then, of course, the garage could use some attention. PS: It should be noted that Mauri was not asked to resign. Folks have expressed sadness at the decision but fully understand and accept it. I am so excited … And sad. I’m gonna miss that crazy guy!! Gosh Mauri, you are someone I would love to meet! I too have been greatly touched by Mauri’s music ministry ever since I first was becoming involved in the Northwest Yearly Meeting and I heard him lead worship at Yearly Meeting. The past soon to be ten years I have found it a privlege to enjoy that worship here at Newberg Friends I count myself most blessed. Since I too am planning changes in the year ahead I know that there comes a time and I look forward to what and where the Lord leads us all. I know music runs through the veins as does the love of the Lord Jesus Christ: I pray for opportunity to continue following this journey and listening to your music Mauri: Would love to have CDs to play on the east coast where I am relocating later in ’14! There is a time for everything…., and this is your time! I know great things are yet to come as God guides you on this next journey. Congrats on what was and on what is yet to be! Blessing and Joy to you both (and the fam) as you write this next life chapter — now you have time to come to Ca. and visit — expecting to see you soon. Even since the days when I joined your GFU class of ’68 you have shown your outstanding ability to minister in music. Even more importantly, in the years since you have demonstrated outstanding ability to get others to let their musical gifts out in special ways. As a fellow musician (albeit vocal only) I am deeply appreciative of the variety of ways you have led folks to express their faith and joy in living for Christ. I would not dare go into many ways you’ve been a personal helper and encourager to me. Speaking from my advanced age, you just need to “hang on” for the next thing God will give you to do! He can really surprise us! Wow! Huge loss for Friends Church, but huge gain for the next beneficiary of whatever God leads him to! Well done good and faithful servant!